For years parents have worried about how TV and videogames affect their children. Many are concerned that too much electronic entertainment will turn their children into depressed loners who spend all their time on the couch. But is there really an association between depression, TV watching and videogame playing? According to a recent study, this image is only half true: Passive television viewing is indeed a catalyst for depression, but no such link exists with videogames. Using data collected in 1995 and again in 2002, the study aimed to find out how different media outlets affect children and their chances of becoming depressed later in life. By utilizing a sample set collected from the National Longitudinal Study of Adolescent Health, Dr. Brian Primack and his colleagues at the University of Pittsburgh selected 4,142 adolescents who didn't have depression, measured their media usage habits and then looked at the incidences of depression in the same sample seven years later. After that period of time, 7.4 percent of the participants exhibited signs of depression - and one common trait among those who showed symptoms was excessive TV viewing. In fact, the link was strong enough for the researchers to conclude, "Those reporting more television use had significantly greater odds of developing depression for each additional hour of daily television use." 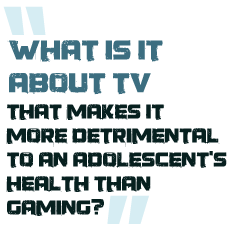 This finding begs the question: What is it about TV that makes it more detrimental to an adolescent's health than gaming? In a word, advertisements. Most hour-long TV programs now have over 15 minutes of commercials. That adds up to a lot of time spent listening to advertisers tell you exactly what's missing from your life - and how their product will improve it. "The bottom line is that when we do sit down and think it is nice and relaxing [to watch TV], the reason we feel that way is because our thinking brain is completely turned off," Dr. Primack explains. "It can almost be related to commercials brainwashing us, and saying 'you want this in your life.'" Unlike TV watching, playing videogames requires constant attention for you to succeed. While a few TV channels like The History Channel and Discovery do require an active brain, most programs are a passive experience. The same cannot be said for videogames.